This wet and dry industrial vacuum is a very simple single phase industrial vacuum, ideal for the metalworking industry where metal chips mixed with oil/coolant have to be removed from machine tools. The FM version is recommended for the collection of fine dust. An optional HEPA filter is available for such applications. 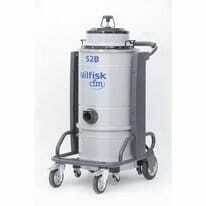 The Nilfisk CFM S3B has 3 independent “by-pass” motors and is available in 50 L or 100L bin. The manual filter shaker ensures good efficiency of the filter and the release container system allows easy emptying of the drop down bin.